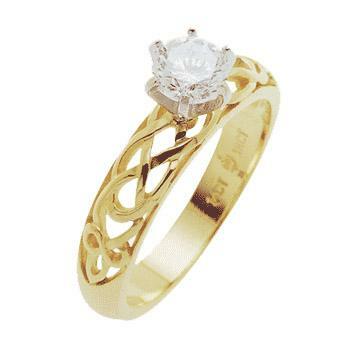 If you have Irish heritage, a Celtic engagement ring is a beautiful way to honor your roots. It's also a lovely way to show your appreciation of Irish culture. Although you may not be able to find Celtic rings in every jewelry shop in town, there are plenty of excellent sources for these unique wedding bands. Specializing in custom-made Irish engagement rings, deSignet International has an extensive selection of gorgeous Celtic designs. Each design can be customized with various gemstones, your choice of precious metals, and lots of extra embellishments. With more than 30 basic ring designs, each of which can be fully customized, deSignet offers many different choices. Simple solitaire designs like Maureen, feature delicate Celtic knotwork and a classic silhouette. Others, like Mary, offer a more unique, two-tone look and a lower profile. No matter which ring you choose, you'll love the Celtic knots, dragons, and other lovely Irish motifs. Prices range from about $330 to about $2700 without stones. You can also have the ring pre-set with your choice of stone or diamond shape, ranging from sparkling diamonds engagement rings to semi-precious gems like amethyst. The stones are affordably priced, and most designs will accommodate a range of shapes and sizes. deSignet has a brick and mortar storefront in Grand Island, New York. However, you can shop the full selection of their beautiful rings online. When you place a custom order, deSignet will send you a sketch of the wedding ring design for your approval. After you've approved the sketch, production of your custom order takes about two weeks. You can pay extra to get your ring more quickly. According to reviews on WeddingWire, you really can't go wrong when purchasing from this company. Past customers praise deSignet's willingness to take time with each customer, designing the perfect engagement ring and creating a sketch. Brides are also impressed by the company's affordability and the quick turn-around time for rings. Reviews indicate that deSignet customers are thrilled with the end result. Because deSignet works directly with the customer to design the ring and has the customer approve a sketch before they begin work, they don't accept returns of custom rings. However, all rings carry a lifetime guarantee. If your ring doesn't stay looking lovely, deSignet will repair or replace it and refund you the cost of shipping. Shipping costs for your original order will vary depending on where you live. Located in Dublin, Ireland, ShanOre is a jewelry shop that handcrafts Celtic engagement rings and ships them worldwide. Although you won't get the ability to custom design your ring, you'll be able to choose from a wide variety of designs, all made right in Ireland. All of ShanOre's rings are crafted in 14k yellow or white gold, and many combine both metals for a two-tone design and include common Irish styles like the trinity knot or claddagh wedding rings. Rings feature diamonds, emeralds, pink sapphires, and rubies, each specially selected to fit the setting. The designs at ShanOre range from about $1200 to about $3300, depending on whether the gem is included in the price. Some designs like this solitaire Celtic engagement ring allow you to choose your own stone for the setting, which features delicate engraved Celtic knots along the shank. Others, like the three-stone emerald and diamond celtic knot engagement ring, come pre-set with the gems and feature both white and yellow gold. ShanOre has won dozens of awards from the North American Celtic Trade Association over the years, and they have many satisfied customers. They have brick and mortar stores all over the United States, and you can use the store locator to find one near you. You can also shop via the website. According to consumer reviews on WeddingWire, the shopping experience at ShanOre retailers is pleasant and fun. There are lots of beautiful rings, and Shanore is sometimes the only place to find that perfect design. However, the prices are a bit higher than other Celtic engagement jewelry stores, so this may not be the best place to get great values. ShanOre does accept returns although you may have to pay a restocking fee. Products that arrive damaged when received can be returned free of charge within three weeks of the date your purchased them. If you simply change your mind about your ring, you'll need to pay a 20% fee to return it. If the ring has been customized or engraved in any way, it is not eligible for return. Shanore products don't carry a guarantee. Shipping of your ring takes about five to eight business days and is free to the United States. If you need your ring sooner, you can pay for express shipping. 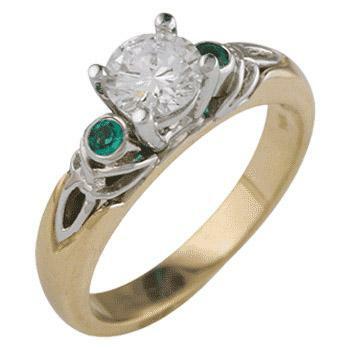 Celtic Revival specializes in all things Irish, including a great selection of Celtic engagement rings. You can choose from dozens of different designs, all featuring beautiful knotwork and Irish motifs. The rings at Celtic Revival are crafted from 14k yellow gold, 14k white gold or platinum. Most designs are available in either metal, so you'll need to select your preference when you order. The rings come pre-set with gems, but you can also request a larger or smaller stone, a different gem, or no stone at all. Gems include diamonds, yellow sapphires, and emeralds. Prices range from about $1200 to more than $3000, depending on the design and the gem. You'll notice a wide range of style options, including the gorgeous Celtic Spirit with a half-carat diamond and openwork Celtic knots and the pretty Trinity ring, which has a two-tone design featuring trinity knots, a center set with a diamond, and two gems of your choice on each side. Celtic Revival has a showroom in Medford, Massachusetts if you're interested in shopping in person. Online sales are available worldwide. According to WeddingWire, consumers love that Celtic Revival will work with them to do custom engraving or to find the perfect ring. The customer service is excellent, and consumers love the end product. Order processing from Celtic Revival takes about four weeks, especially if you choose to engrave your ring or select a non-standard gem or metal. Celtic Revival's website is short on important policies like returns, guarantees, and other information. However, they enjoy working directly with customers over the phone and can answer questions you may have about these policies. You can reach Celtic Revival by calling 1-781-395-7828. You can also find lovely Celtic rings at stores that don't specialize in Irish engagement jewelry. The selection at these stores is a bit more limited, but it's worth checking them out as you search for that perfect ring. Brilliant Earth - This site specializes in ethical diamonds, and they have some lovely Celtic designs. You can also create your own Celtic ring using their custom jewelry design service. Gemvara - An online jewelry store with a wide range of wares, Gemvara also has a few very lovely Celtic rings. You can customize the rings with your choice of gem and metal. Seawear - Seawear mostly sells nautical jewelry, but they also have some lovely Celtic engagement rings and wedding sets. Take your time when shopping for an Irish engagement ring. If you shop around and view the selection at a number of different shops, you'll find the ring you know you'll always love.